As an open, free event, WaterFire Providence is entirely dependent on donations and sponsorships. WaterFire will work with you and your company to develop a partnership that will fulfill all of your specific business needs. There is a variety of exciting ways in which you can help keep the fires burning in 2019. All of our partnerships are rewarding and include opportunities that allow your company to be a part of WaterFire. These partnerships are designed to maximize media attention, recognize your employees, focus on client development and acknowledgment, and more! WaterFire Lead Sponsor: All lead fire sponsorships include instant reservation and placement of your WaterFire date on our schedule as well as WaterFire season sponsor benefits. WaterFire Season Sponsor: Sponsor the entire WaterFire season to take advantage of radio spots, press releases, private receptions, cable and broadcast television spots, and many other exclusive benefits. WaterFire Co-Lead Sponsor: Acquire many exclusive benefits for your company such as a special location for your own VIP reception and recognition as a sponsor throughout that WaterFire event. Signature Featured Events: Some of the most popular WaterFire attractions, such as the WaterFire Ballroom and Jazz Stage, have become essential to Providence nightlife. We have great ideas for some signature events and would love to hear any great ideas that you have too! There is also the opportunity to partner with the series mentioned above and be a co-sponsor for the evening. Help us present another exciting night to thousands of Rhode Island visitors while enjoying your own reception next to all of the action. Night of Dancing: The Ballroom is a part of the grand WaterFire installation, capturing the hearts and imaginations of all WaterFire visitors. This popular venue features live music, dance lessons and demonstrations, and open dancing under the stars, all while surrounded by the breathtaking architecture of the downtown Providence Financial District. This event is open to the public. Sponsor the Jazz Stage at WaterFire: WaterFire visitors and your guests can experience the feel of an authentic Chicago jazz club only a few steps from the river and flames at the outdoor Jazz Stage concert series. The urban landscape is transformed into a backdrop and stage for the region’s top jazz musicians and vocalists to perform public concerts to tens of thousands of people each night. 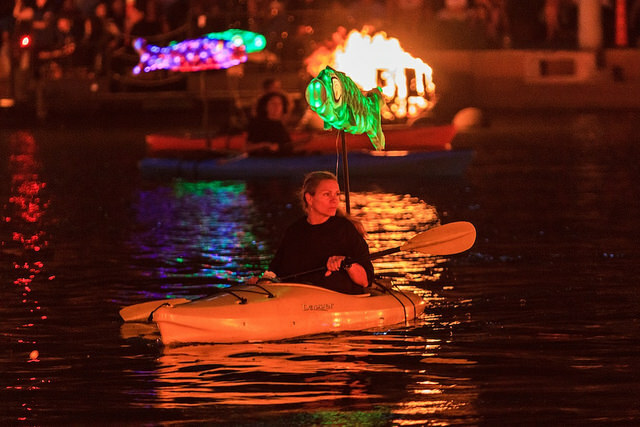 Clear Currents: Sponsor one of the most spectacular visual events on the river as dozens of illuminated koi fish, mounted to canoes, race into the river to bring awareness to the environmental importance of one of our most essential resources: Water. Clear Currents paddlers in the Waterplace Park Basin. Photograph by Jeff Meunier. Take this unique and exciting chance to be a part of the WaterFire family. 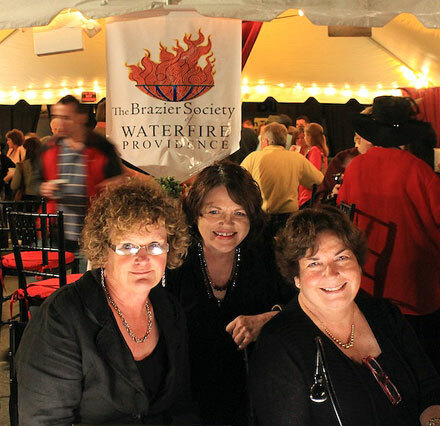 Partnerships include access to the exclusive Brazier Society VIP tent at all full WaterFire lightings fully catered by FireWorks Catering. The tent includes complimentary beer and wine and a private space to enjoy WaterFire. Partners are also granted access to WaterFire’s exclusive boats, so guests can enjoy WaterFire from the best seats in the house: on the river. The Brazier Society is the perfect means for client development, employee recognition, or family fun. Find out more about the Brazier Society here! Ring of Fire: An amazing, visual way to start WaterFire or bring attention to your message. Up to 100 torches carried by guests of your choosing will proceed into and surround the basin. Your sponsorship will be recognized on our event page on the WaterFire website, in a press release detailing the special events for the evening prior to the fire, and on that evening’s event pamphlet. Flower Performer Sponsor: Very special WaterFire characters hand out an array of beautiful carnations to our visitors from the boats as well as from the shore. Each carnation carries an inspiring quote. WaterFire works with the Groden Center to provide therapeutic training and engagement for autistic individuals to assemble and attach 1,000 inspirational quotations onto the carnations. As a Flower Performer sponsor, your name will be printed on the back of all 1,000 quotation ribbons distributed to the crowd that evening. This is an amazing opportunity to support the good works of the Groden Center and WaterFire. Fire Dancer: Sponsor the mesmerizing fire dancer Spogga for the evening. Spogga has entranced millions of visitors for many WaterFire seasons and has become an integral part of the event. He skillfully dances amidst the fire gracefully spinning and manipulating two orbs of fire as he glides atop the river. Sponsoring Spogga for the evening will give you the opportunity to meet the master of fire dancing himself, be listed in that evening’s pamphlet, and on the event’s page on WaterFire’s website. Ceremonial Fire Lighter: Honor someone special by having them set WaterFire ablaze. You and a companion, or any two people that you wish to thrill thank, honor, or surprise, can board the boats and be one of the fire-lighters for the evening. This is an unforgettable experience that you and your guests will treasure forever. Join Plan Your Trip to Providence: Over one million visitors come to WaterFire each season and over 50% of them are from out of state. These visitors start to plan their evening by visiting our website. 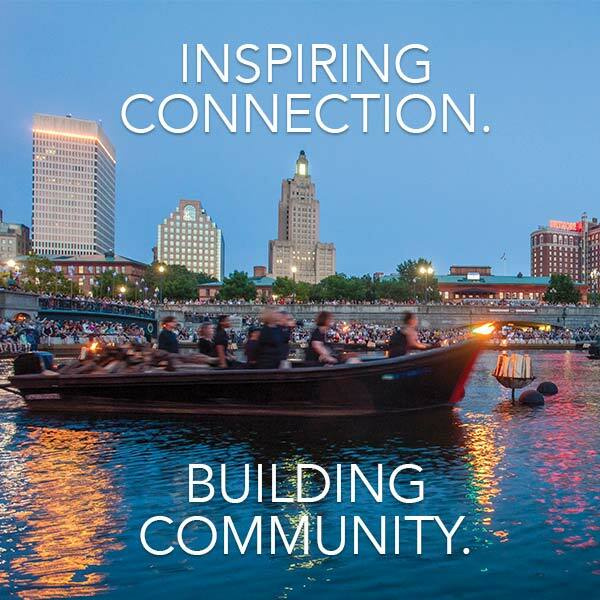 Your hotel, restaurant, or attraction can be listed on WaterFire’s “Plan Your Trip to Providence,” page with a link and logo to your website. Connect with thousands the first place they look to begin planning their trip to the Creative Capital. To partner with WaterFire or to inquire about more information please contact Ed Cabral by calling 401-273-1155 x 5541 or email ed@waterfire.org.